“Opera, like any other art form, has its cult figures, typically singers who died young and enacted tragedies, on stage or sometimes in their own lives. 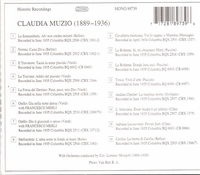 While Maria Callas is probably the best known of these, Claudia Muzio has her own legion of devotées. Like Callas, her voice had a certain veiled tone, one making it near-perfect for tragic heroines; she was an excellent actress and a beautiful woman, and also had some major vocal troubles towards the end of her career, though was still able to thrill audiences by her vocal and physical communication. (There was something of a personal connection as well - Aristotle Onassis had been Muzio's lover earlier in his life, Callas' much later.) Muzio's vocal acting was poignantly subtle, based on colors and shading of her tone, rather than the harsh-toned, uncontrolled shrieks or melodramatic gulping sobs that too often passed (and still do) for dramatic high notes or powerful involvement, and she was known as ‘the Duse of song’, after Eleonora Duse, an actress famed for her intensity. During most of her life she was more or less a recluse, and avoided society. She came from a background that combined music and drama; her father was an operatic stage director at both the Met and Covent Garden, and her mother an opera house chorister. She studied at an early age with Annetta Casaloni, the mezzo-soprano who created the role of Maddalena in Verdi's RIGOLETTO, in Turin, and made her own operatic début as Massenet's Manon in Arezzo in 1910; in 1911, she made her first recordings, an aria from LA BOHÈME and part of LA TRAVIATA. Her La Scala début was as Desdemona in 1913. This was so successful that a member of the Paris Opéra management immediately offered her the same part for the next season, and a representative of the Covent Garden management heard her in rehearsals, and immediately offered her the role of Manon for the next year. However, while she sang several roles during just ten weeks there, that was the only season she sang at Covent Garden; much of the remainder of her career was in Italy and North and South America, especially at the Teatro Colón, where she was known as ‘La unica’.